For my kids’ school lunch program, I have a debit card on file in their online payment portal that debits my card $30 every month. I hadn’t looked at the online payment portal in many months, and I didn’t realize that my debit card on file had expired. The payment system sent me an email, but I get so busy at work that I don’t always check my personal email. So for three days my girls’ school lunch account went further in the red. A quick text would have helped solve the problem a lot faster. Attempt to reach the borrower by phone. This could be problematic if the borrower screens their calls and assumes the number is just a solicitor or debt collector. Send the borrower an email about their card expiring. This too can be challenging if the borrower doesn’t constantly check their email. Send the borrower a text alerting them that their card has expired. 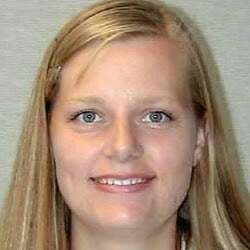 Of all the possibilities, this one will likely be your best bet to reach the borrower in a faster, more responsive way. You may not currently be set up with texting capabilities using our loan management software (CIM GOLD). Never fear—just contact your GOLDPoint Systems account manager and inquire about what it would take to get you set up. This is a feature you do not want to miss out on. The GPS Notification System is capable of sending out SMS messages to customers through two texting providers. First, we have GPS.Texting, which uses Twilio’s web service to send and receive texts. The second provider is Solutions by Text. Not only do they send and receive text messages, they also help with text message wording to stay in compliance and phone number validation. You will need to decide which provider you would like to use. These next steps demonstrate how to send texts to borrowers using our GPS Texting (not texts sent through Solutions by Text). In this example, we will be sending a text to borrowers where the card on file for recurring payments has expired. Set up a template for the text. 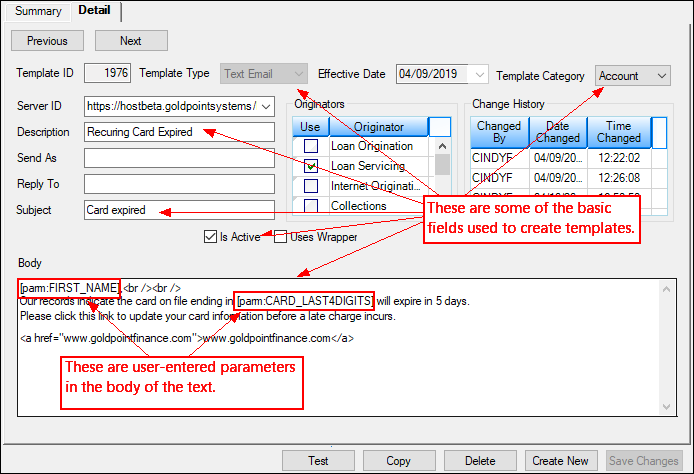 Send the text from any screen in the Loans system in CIM GOLD. This step requires assistance from GOLDPoint Systems, but this will give you the general overview of how we do things. Now we are ready to send applicable customers the text. 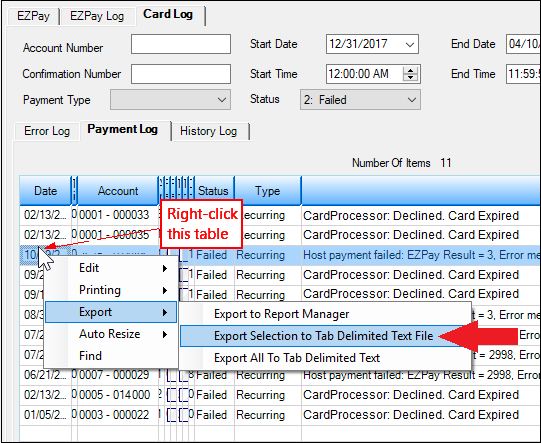 First, we will filter the Card Log screen > Payment Log tab to view all payments that were rejected. 2. You may need to clean up this list once you open it in Excel to make sure only those accounts that had a card expiration are included. Save and send that list to the person responsible for this task. 3. That person will access any of the loan account screens in CIM GOLD. 4. Enter one of the account numbers from the Excel document (Card Log list) in the top account field and click "GO". 5. 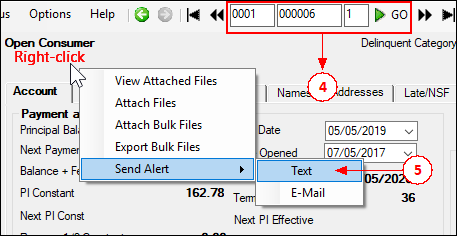 Right-click on any part of the screen that is not a field and select “Send Alert > Text” from the pop-up menu that appears, as shown in Figure 1 below. The Send Text dialog box will appear. 6. Select the Template created from Step 1: Setup a template for the text above. 7. Select the borrower and phone number where the text will be sent. 8. If the text includes any user-entered parameters, enter the Value of those parameters as illustrated in Figure 2 below. 9. Click <Render> to see the how the text will look when sent to the borrower in the box on the right. 10. If everything looks right, choose the Release Date and Release Time this text message will be sent to the borrower. 11. Click <Queue Message>. The text will be sent to that borrower on the specified day and time. Option 2: If you are the one responsible for sending the texts and you do have access to the Card Log screen, you can quickly send the texts directly from that screen. Using the list as a guide, enter the first account number in the Account Number field at the top of the screen for who you want to send a text, then click "GO". 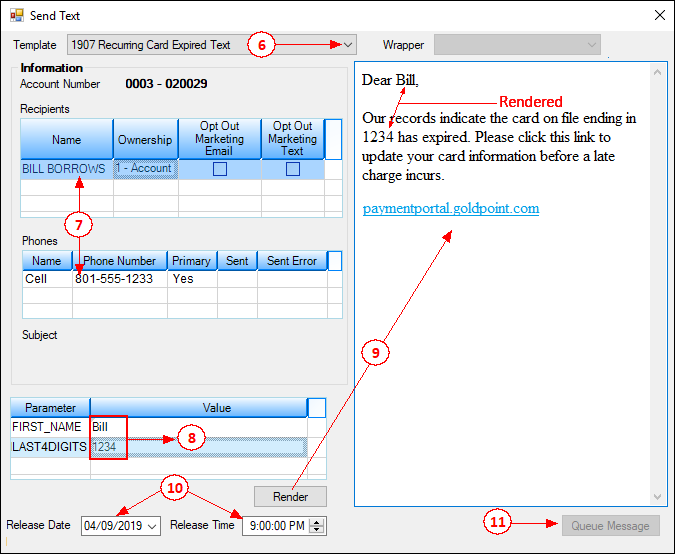 Right-click any gray area on the Card Log screen and select “Send Text” from the pop-up menu that appears. Complete the same steps outlined above (steps 5-11) for sending the text message. Repeat these steps for the next account in the list. This is just one small example of how to use the Notification system. For certain activity, such as upcoming payment due dates or payments past due, we can set up triggers to automatically send your customers text messages reminding them about payments. See the Triggers topic in the Notification manual on DocsOnWeb for more information. The Notification system is a versatile and excellent way to communicate with your customers. 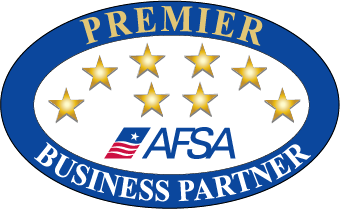 Contact your GOLDPoint Systems account manager if you would like to know more.